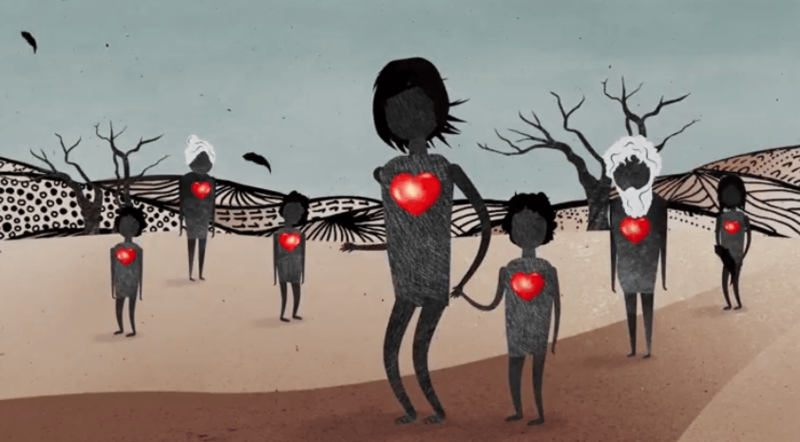 Still from an Intergenerational Trauma Animation which was launched at The Healing Foundation's #OurFuture Youth Webinar on 24 July 2018. Professor Helen Milroy, a descendant of the Palyku people of Western Australia’s Pilbara region, was recently a Commissioner on the Royal Commission into Institutional Responses to Child Sexual Abuse. In the post below, she talks about how a recent forum with young people on intergenerational trauma sparked a conversation that she would like practitioners across all service sectors to be more involved with, in order to close the gap in Aboriginal and Torres Strait Islander health. She foreshadows new research that she says is building a very disturbing picture of disability, poor health and economic disadvantage for the Stolen Generations and their descendants and urges a renewed emphasis on the strengths and protective factors that have allowed Aboriginal and Torres Strait Islander people to survive − despite trauma and adversity. Milroy, a professor of child psychiatry, talks about intergenerational trauma also in this video produced by The Healing Foundation. Last week I took part in a Youth Webinar, exploring the impacts of Intergenerational Trauma in Aboriginal and Torres Strait Islander communities. The digital forum, hosted by The Healing Foundation, brought together young leaders, community organisations, students, teachers and trauma experts, keen to contribute to a conversation about how we can break the trauma cycle. It’s a conversation that I’d like to see practitioners across all service sectors get more involved with. Why? Because tackling Intergenerational Trauma is the key to Closing the Gap for Aboriginal and Torres Strait Islander people, and trauma-informed practice is essential to making sure our people have access to health services to treat complex health needs. Developing an understanding of what drives behaviour, rather than labelling the behaviour itself, is a common problem we face when working with young people. But in the context of Intergenerational Trauma, within a cross-cultural environment, the challenges are far greater. The complexity of life and development makes it harder to work out what all the issues are and where an effective intervention can be applied. To work effectively with Aboriginal and Torres Strait Islander young people and their families, practitioners need to take a comprehensive approach, involving an understanding of cultural frameworks and the historical legacy of colonisation. For Aboriginal and Torres Strait Island people, the causes of trauma didn’t occur in a single generation. They reach back for 230 years, in the shape of frontier violence, massacres, disruption from homelands and more recently, the extensive forced removal of children from their families, the Stolen Generations. This series of traumatic events didn’t just occur to an individual, they affected whole families and communities, meaning the trauma is both collective and cumulative. Listening to the stories of Aboriginal and Torres Strait Islander people during the Royal Commission into Institutional Responses to Child Sexual Abuse, I was struck by the accounts of generational removal and disruption − where up to five generations of one family were sent to institutions. It’s really not surprising that we are still experiencing the impacts of trauma today, when parents, children and grandchildren are all affected by both shared and individual experiences, which are compounded by ongoing racism. And we most definitely are still feeling the impacts. Through my work with The Healing Foundation, I’m aware of some new research being collated by the Australian Institute of Health and Welfare that’s building a very disturbing picture of disability, poor health and economic disadvantage for the Stolen Generations and their descendants. When released, it will be the first time we’ve had comprehensive data to illustrate the link between forced removal and the symptoms of Intergenerational Trauma, such as mental health problems, suicide and family violence. For example, the report shows that the descendants of the Stolen Generations are almost twice as likely to have experienced violence and 1.3 times more likely to report poor mental health than other Aboriginal and Torres Strait Islander people, who are already at a disadvantage in Australia. The data might not be much of a surprise to those of us who have been living the experiences or working in the field, but it will be essential in driving and designing new healing programs. What we need to get back to is an emphasis on the strengths and protective factors that have allowed Aboriginal and Torres Strait Islander people to survive − despite the trauma and adversity they have experienced. Factors like extensive kinship systems, cultural and spiritual strengths, traditionally strong child rearing practices and early autonomy and self-reliance. We also need to develop the cultural healing programs that will help us to move forward. At a recent international mental health leaders’ conference, many people were calling for inclusive, compassionate, respectful and holistic models of care. This is what Aboriginal and Torres Strait Islander communities had for generations and continue to develop today − strong systems of care and healing at a community level, and an ecological framework of being in balance with the environment. Based on our innovative track record already in health and wellbeing, I really think we can lead the way in regard to healing trauma − we just need to develop those old ways, in the context of a modern Australian society. Last week’s webinar renewed my confidence in that belief for a brighter future. Our young leaders never fail to impress me with their drive, innovation and level of awareness, and I encourage everyone to access the recording of the webinar to hear their experiences and ideas firsthand. You will also find a suite of new resources, developed by The Healing Foundation, that explain where Intergenerational Trauma comes from and guides trauma- informed practices through videos, timelines and factsheets. Because of the magnitude of traumatic events linked to our history of colonisation, there are fewer adults in Aboriginal and Torres Strait Islander communities today to buffer children, creating a massive burden on young people to lead the way. They’re up to the challenge, but as professional practitioners, we need to help reduce that burden and we all have a role to play. By understanding the complexity of issues facing Aboriginal and Torres Strait Islander children and young people, you can identify your role in making a difference. • Helen Milroy is a descendant of the Palyku people of WA’s Pilbara region. She is a professor of child psychiatry at the University of Western Australia’s Medical School and a commissioner with the National Mental Health Commission. Helen was recently a Commissioner on the Royal Commission into Institutional Responses to Child Sexual Abuse. This is a great article Helen. Thanks so much for posting this. On the back of the Apology to Aboriginal and Torres Strait Islander people which the Australian Psychological Society delivered in 2016, Tanja Hirvonen and I have developed a workshop which we’ll be delivering at this year’s APS Congress to look specifically at what practitioners can do in their practice to be more engaging and effective with Aboriginal and Torres Strait Islander people. This is a crucial issue which we need to take very seriously. Clearly we need to start acting differently if we want different results. In our workshop we’ll be picking up on many of the important issues that you raise such as the impact of colonisation and the importance of focussing on strengths.